The 2-year celebrations continue on! I was going to be posting this little sample earlier but some things came up and so I found myself super-busy. Anyways, here it is as promised, with a little bit of an intro to the project itself. So, the year 2012 ended a few days ago, and it’s been an absolute blast, to say the least. Write ~420,000 words of both fiction (various submissions and novel projects) and non-fiction (reviews and blogposts). Read 400 novels, comics, novellas, stand-alone short stories (still not sure if these SHOULD be included) and listen to some audio dramas and audiobooks. At the end of October, I was very close to both of those goals, having crossed the ~472,000-word mark, and was still ahead on the reading goals, as I was at 352/400 on September 30th. You can find the November report here. As the title says, I was conflicted about what to post for today’s Advent Reviews. I didn’t want to do any negative reviews, for an obvious reason: today is Christmas Eve after all and it’s time for good cheer, not for me to rain down on someone’s parade! Doing negative reviews before was fine, kind of. I didn’t want to do a positive review either, since I do so damn many of them anyway. I often take a lot of flak for being that positive, especially when it comes to Black Library publications, so I wasn’t really on the mind for any of that either. Just thinking of any possible backlash rains down on my parade, you know? In short, I didn’t want to do a review period. What follows is a stream-of-consciousness post. Apologies for any incoherency. Paul’s Erevis Cale Trilogy was my first introduction to Forgotten Realms, and to Wizards of the Coast, earlier this year, and it’s turned into a fascination with the entire setting that just refuses to go away. I haven’t read as much within it as I’d like, but the stuff I’ve read has been fairly good so this fascination is definitely here to stay. Plus Paul is an excellent writer in my opinion. This is another from-memory review so if I get anything wrong, I do apologise. I’m a huge fan of Matt Forbeck’s work: whether it’s novels or comics. I have yet to read any of his work that I didn’t like, and he has been the most consistent author for me to date, not to mention that he’s also the one I’ve reviewed the most! That creates certain expectations of course, and Hard Times In Dragon City fulfills those expectations quite nicely. As the first Shotguns & Sorcery novel, this is the fourth in his 12-for-12 project in which he aimed to write one 50,000-word novel a month. I’ve read the first trilogy, Matt Forbeck’s Brave New World, and it’s superb superhero fiction. Exciting stuff! Horror isn’t my favourite genre by any means. Especially not when it comes to comics. But I’m always ready to read something different, and that’s where Steve Niles’ Lot 13 ongoing series for DC Comics comes in. Lot 13 is straight-up horror with ghosts and brutal murders and so on, not the kind of comic I’d normally read. I read these two issues just today, and since I needed some sort of different reviewing fare for my Advent Calendar, I thought I’d talk briefly about this series. November ended a few days ago, and so far this year, it was my busiest month ever, in terms of writing; busiest by far, as you’ll see after the break. At the end of October, I was very close to both of those goals, having crossed the ~377,100-word mark, and was still ahead on the reading goals, as I was at 304/400 on September 30th. You can find the October report here. My apologies that this is going out so late, but the whole idea was a very spur of the moment thing so I couldn’t get this ready in time. Just to recap, this page will link to all the Advent Reviews that go up this month, whether on this blog, on The Founding Fields, or to the guest spots I’ve arranged with some blogger friends. Enjoy, and let me know what you thought about all these stories! I would have made the whole thing snazzier, but can’t figure out how to do side-by-side content in WordPress! Click on the links to go to the reviews. The actual manuscript word-count is 64,001 words at the moment. I ended mid-scene to wrap things up and get my validation in before the clock hit midnight. 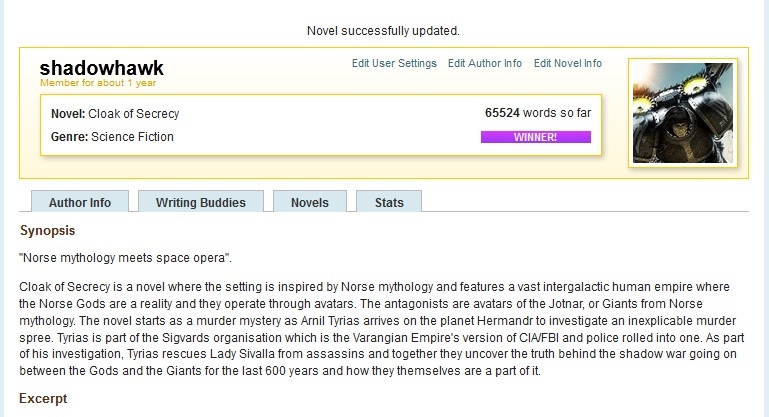 The extra ~1,500 words there are from the chapter synopses and the little backstory stuff I wrote in Scrivener. Another year, another win. 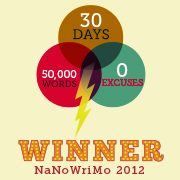 I call this a successful writing month. AND NOW I CAN GO FRIKKIN RELAX FOR REALS.